Mike Ehrmann/Getty ImagesNick Foles of the Philadelphia Eagles celebrates with the Lombardi Trophy after defeating the New England Patriots 41-33 in Super Bowl LII at US Bank Stadium on February 4, 2018 in Minneapolis, Minnesota. Philadelphia Eagles quarterback Nick Foles played a pivotal role in defeating Tom Brady and the New England Patriots in Super Bowl LII on Sunday. After he threw for 373 yards and three touchdowns, he was named the Superbowl’s MVP. 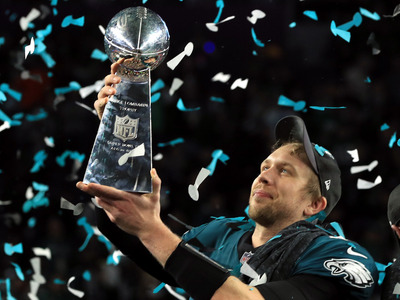 Foles has had an up-and-down career – after getting benched in 2015, he contemplated retirement from the NFL. His journey from benchwarmer to Super Bowl starter is one of the wildest in recent memory. Sunday’s Super Bowl LII matchup between the Philadelphia Eagles and the New England Patriots pitted arguably the most accomplished quarterback of all time – Tom Brady – against the Eagles’ unheralded quarterback Nick Foles. Foles led the Eagles to victory at 41-33, after throwing for 373 yards and three touchdowns. He also caught a score, and was named MVP of the game. 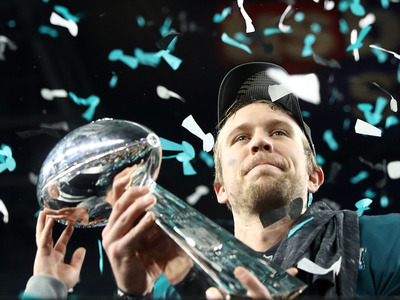 While most of the talk leading up to the game centered on Brady’s quest for a record sixth Super Bowl ring, Foles has a compelling narrative of his own. The 29-year-old journeyman looked to be the Eagles’ franchise quarterback five years ago, before an injury, a trade, and a disappointing season had him contemplating retirement from the NFL. 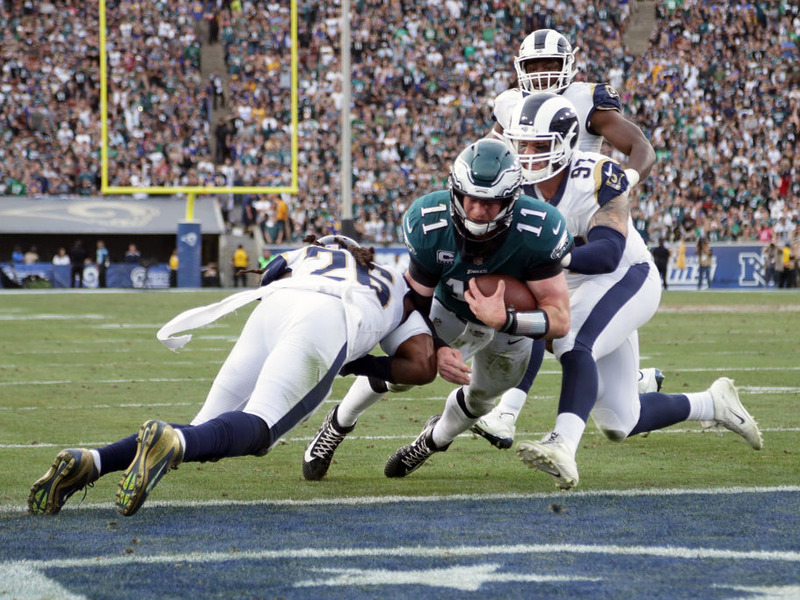 Back with the Eagles, Foles was thrust into the spotlight after star quarterback Carson Wentz was sidelined with a torn ACL, forcing Foles back into the starting role with the hopes of an entire franchise on his shoulders. After their victory, it looks like he has come through. 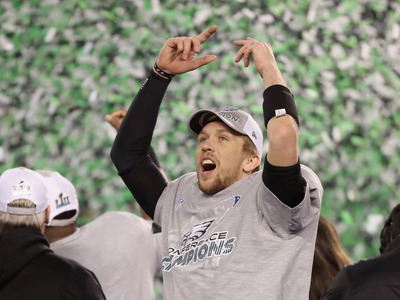 Read on for Foles’ wild journey from benchwarmer to Super Bowl champion. Nick Foles was drafted by the Philadelphia Eagles in 2012 after a successful college career at Arizona. Foles initially backed up Eagles starter Michael Vick. Foles started six games for the Eagles after Vick went down with a concussion. With Foles at the helm, Philadelphia went 1-5, and he was relegated to backup duty again the next season. But when Vick went down again in 2013, Foles had his breakout year. He threw 27 touchdown passes, led the Eagles to the playoffs, and was named to the Pro Bowl. 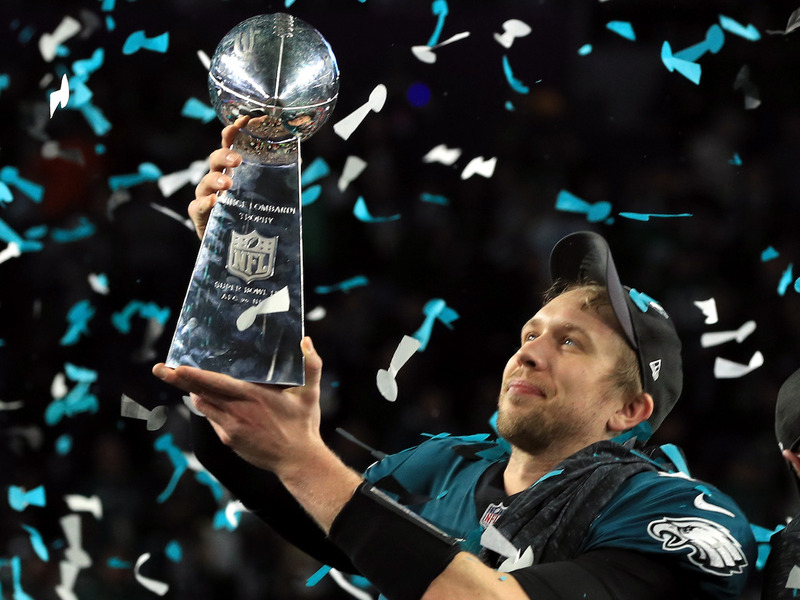 Foles’ numbers weren’t as eye-popping the next year, and after he suffered a broken collarbone, Foles was traded to the St. Louis Rams in the offseason. The Rams went 4-7 with Foles under center. Toward the end of the season he was benched in favour of backup Case Keenum. At the next NFL draft, the Rams chose quarterback Jared Goff with the first overall pick. Foles requested to be released, and at age 26, he was considering retiring from the NFL. But he was thrown a lifeline by the Kansas City Chiefs coach Andy Reid, the former Eagles coach who drafted Foles in 2012. Foles barely played with the Chiefs, appearing in just three games, but his stint there was enough to keep his career going. In March 2017, Foles agreed to return to the Eagles, backing up their new, promising quarterback Carson Wentz. Wentz, in his second year, led the Eagles to a red-hot 10-2 start and had Philly looking like a Super Bowl favourite. But he went down in Week 14, forcing Foles to finish out the season. 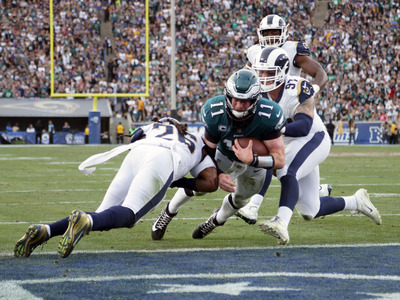 The Eagles went 3-1 in Foles’ games, but there were concerns heading into the playoffs. Despite having the best record in the NFC and home-field advantage, the Eagles were considered underdogs without Wentz. But Foles rose to the occasion, winning a gritty battle against the Atlanta Falcons in the divisional round and then routing the Minnesota Vikings 38-7 in the NFC Championship Game. In the latter game, Foles played virtually flawlessly, going 26-for-33 with 3 touchdown passes. Interestingly, the Vikings quarterback Foles outdueled was none other than Case Keenum, Foles’ former Rams teammate who took his starting job in 2015. Now, Foles is on the doorstep of history. On Sunday, he’ll square off against Tom Brady and the New England Patriots in Super Bowl LII. With his victory, he’s capped off the wildest ride to the Super Bowl for any quarterback in recent memory.